October | 2014 | Go Chapel Hill! Chapel Hill Reminder of Safety First on Franklin Friday Night! Cycling and walking is encouraged to downtown event October 31, 2014! Chapel Hill residents will begin to see immediate action steps this month targeted to improve bicyclist and pedestrian safety including new flashing lights at mid-block crosswalks, safety signage, and a step-up in traffic education and enforcement activities. Town Manager Roger Stancil has established a new interdepartmental staff group that combines law enforcement, planning, traffic engineering, Chapel Hill Transit, parks and recreation, and public outreach representatives. The team is championed by Police Chief Chris Blue with project leaders Police Sgt. Celisa Lehew and Len Cone, Go Chapel Hill community outreach coordinator. The group has identified a number of immediate actions to identify problem traffic spots and improve safety. The staff team will also join efforts with such groups as the Town’s Transportation and Connectivity Board, and the Bicycle Alliance of Chapel Hill (BACH). • Install push-button activated flashing lights at four un-signalized mid-block pedestrian crosswalks on Martin Luther King Jr. Boulevard and East Franklin Street. The existing mid-block crosswalks (total of seven) were installed in 2010, and the Town maintains them through an encroachment agreement with NC Department of Transportation. This will occur during the first week of November. • Launch a WikiMap, an interactive crowdsourcing application that allows users to view an online map and post comments to identify unsafe areas and concerns. The data will become available for Town staff to review, collect, prioritize and provide response. This will be launched in October. • Place “High Crash Area” digital signs near areas where a high number of traffic accidents have occurred. Chapel Hill Police have found that the placement of signs in past outreach efforts have reduced accidents by as much as 50 percent. This will occur in October. • Increase both education and enforcement activities to improve safety and raise awareness. People may receive helpful information, warnings and in some cases, tickets for traffic violations. Officers may cite motorists for failure to yield to pedestrians within the crosswalk and cite pedestrians and cyclists for crossing against the signals or crossing outside the crosswalk. Fines and court costs for these violations begin at $213. This begins immediately. • Trim hedges and clean other debris at intersections where high growth impedes view for travelers and clean foliage away from sidewalks and signs. This begins immediately. In addition to the above, the Town is also looking into a number of new measures — such as painting green bicycle lanes, painting bicycle boxes at intersections and lights, adding signage across town, and improving its public outreach. Many of these efforts are included in the Chapel Hill Bike Plan, which was adopted by Council in June 2014. A major goal of Chapel Hill 2020, the community’s comprehensive plan, is to provide safe connections among neighborhoods, schools, commercial areas, parks, rural bikeways and farms, and business and art/dining/entertainment hubs that promote healthy exercise and environmentally friendly modes of transportation. 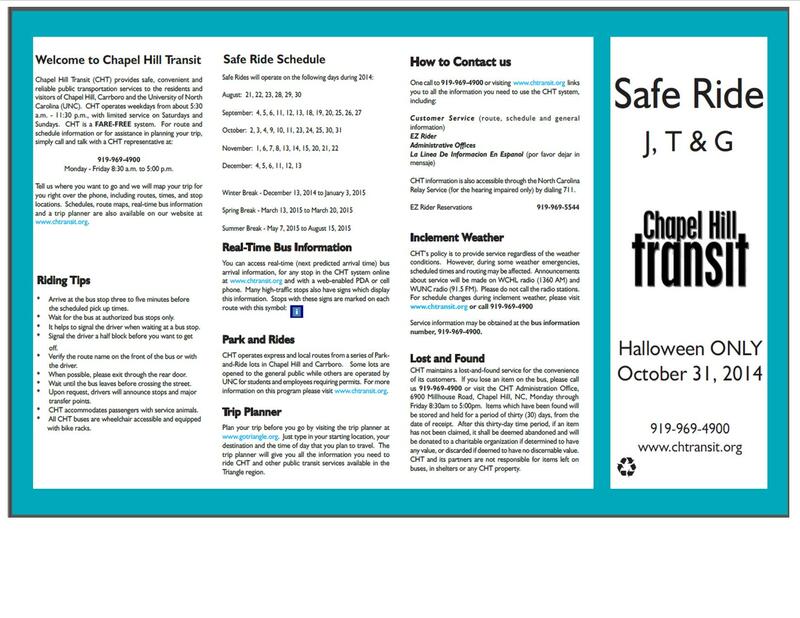 The Chapel Hill Police Department partners with the UNC Department of Public Safety, the Chapel Hill Carrboro City Schools and the NC Department of Transportation to provide public safety education and outreach. Officers regularly conduct outreach and enforcement as a reminder to obey traffic laws, share the road and keep safe. Traffic Engineering focuses on infrastructure including signal lights, pedestrian countdown signals, stop signs, speed limit signs, pedestrian crosswalks, medians, and bike lanes. Traffic controls regulate the speed, volume and flow of traffic. The neighborhood traffic-calming program provides residents an opportunity to present a concern for traffic safety. Community engagement specialists assist with outreach efforts of all departments of the Town, as well as those of the NC Department of Transportation campaign “Watch for Me NC.” Messages are dispersed throughout the year via the website, news releases, social media, occasional advertisements, and at festivals and special events. The Planning Department’s long-range transportation effort works to integrate considerations of bicyclist and pedestrian needs into all facets of transportation planning and programming. Work is underway to create a more connected, bikeable community through the recently adopted Bike Plan. Through the Sidewalk Construction Program the Planning Department prioritizes sidewalks that need improvements to strategically improve sidewalks when funds become available. Parks and Recreation is dedicated to providing recreational opportunities in a safe, maintained and inviting environment. The total land area of Chapel Hill is 21.3 square miles, and about 11 percent of this is dedicated to parks and open space. Since the Town Council adopted an open space plan in 1965, there are now about 1,200 acres of park, open space, and greenway easements totaling 12 miles of trails.